This "Jewelled Seed hand bag" was also hand felted with merino wool in different colors: yellow, green, blue. To create the sumptuous surface design, hand dyed and hand spun yarn (by mio) was used; as well as linen fibres and bamboo. The finnal touch, beads hand sewn around the bag creating pockets of sparkles! It is linned with white, plain cotton fabric. It has two handles which, as with the other handbags, are hand felted and machine sewn to create a bit of an irregular coil... more organic. 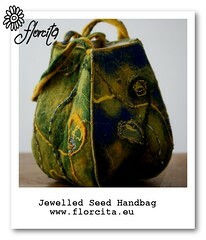 It's already in my dawanda shop where you can also see more pictures of the details of this Jewelled Seed Handbag. If you'd like to purchase this bag, or any bag from this new line, you can also contact me at: info@florcita.com. Click on the picture for a larger view and more detailed pictures.